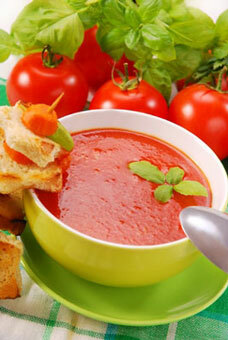 Soups are one of the easiest and tastiest ways of getting your daily serve of vegetables. If the thought of a plate of mushy vegetables doesn't fill you with joy, then try one of our delicious healthy soup recipes. If you think that making soup is too difficult or takes too long, think again. Healthy soups can be made quickly and easily with a few shortcuts. The secret to a really great soup is of course the stock. This is your flavor base. If you don't have time to make your own, it is now possible to buy ready made liquid stock, as well as stock cubes and powders that are free from preservatives. Making your own stock isn't hard. You just need several hours to spare. But the good news is that it can be made in advance and frozen. Once you have your stock, build your soup by adding vegetables, herbs, noodles, beans - really anything you have on hand can go into your soup. The variety of healthy soup recipes is endless. They can be smooth or chunky, hot or cold, clear or creamy. Always season soups at the end of the cooking time. As the liquid reduces, the flavors become more intense and you may not need to season. If by chance you have overdone the seasoning, place a slice of bread in the soup and leave for 5 minutes. It will soak up the excess salt. Maybe you need a recipe for stock?